I got sick of the high prices for coils and decided to start selling them. Everything on the site comes in three colors and in a US or European version. I am also offering free domestic shipping and very reasonable international shipping. Please check my site out and hit me up if you have any questions. SilentJ, davesmith, tennisguru1 and 11 others like this. Hi @710Coils welcome to FC! Are you able to provide custom wiring for compatibility? tennisguru1, GreenHopper, mixchu69 and 3 others like this. GreenHopper and psychonaut like this. SilentJ, tennisguru1, Baron23 and 9 others like this. I wanted to post a few pics of our selection of coils and the colors they come in. We have stock on hand of US(110) and International(220) in Blue, Red, and Black and offer free domestic shipping and very reasonable international shipping. Flowerpot coils are also in the works and I should have more news on those to post. Look at those tight wraps!!! SilentJ, tennisguru1, StormyPinkness and 7 others like this. Any plans on releasing 45 degree/angled handles like some other companies are switching to in order to minimize strain as well as help prevent rig tipping accidents? 710Coils, psychonaut and GreenHopper like this. @biohacker bending the arm doesn't actually relieve the weight, it makes it hang harder on the coil once the coil has heated up. But if you are using a metal banger. You could bend the arm, you would just want to make sure to not stress it when bending. The one variable here is the wires that run inside the cloth cover. If any of those get weak or break. The coil is dead. I found that pointing the arm back towards the neck of my piece helped balance out the weight on the joint some. 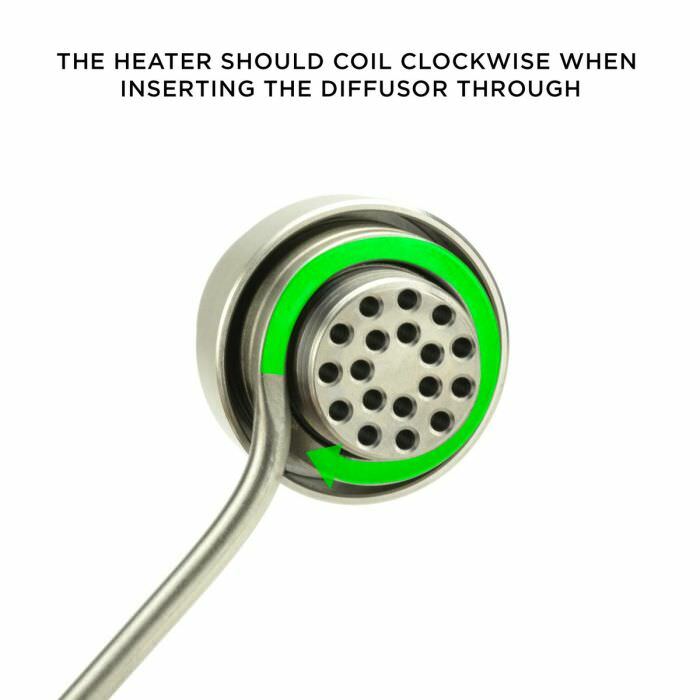 When the coil heats, it will expand and in turn allow the coil body to move slightly. This is due to the weight of the arm and the thing I found to fix this. Was to introduce a clip to support the weight of the arm once it was heated. When the coil cools, it shrinks and this is where most bangers will break. The coil has shrunk and in turn causes stress to the banger and it will break once the coil is turned back on. Or will just break once the coil and banger have completely cooled down. I am going to offer the clip kits on my site and they will come in 5 sizes. They are FDA approved so no off gassing and are rated to 400 degrees Fahrenheit and the clips are stainless steel. anasrzi, SilentJ, Hogni and 2 others like this. What do you mean by hang harder once it's heated? I'm just curious, as i've heard that high quality coil manufacturers are moving toward these angled coils for the reasons i've stated. High5 is one of them. Nice looking coils, what material are they made of (the coil outer housing) ?Please specify grade if you can ,i am betting on SS304 . SamuraiSam and 710Coils like this. @biohacker When the coil is fully heated. It will expand and the metal will be easier to open up due to this. Bending the arm can lower the stress on the banger. But can also change the stress on the joint of your glass. This is where I moved towards angling my coil arm back towards me instead of outward towards the Enail controller. SilentJ, Baron23, scalescliffs and 3 others like this. SilentJ, Baron23, Likes2vape and 6 others like this. We have successfully shipped to Germany and got a great response to the quality of the coil and the time it took to get there. We will ship pretty much anywhere in the world and offer free domestic shipping, along with same day turn around of orders being sent to USPS. Baron23 and Likes2vape like this. IN FOR A VROD COIL! 710Coils and Easywider like this. We only show actual reflection of stock on hand and will never charge anyone if we don't have the coil in stock. Baron23, ChurroForSure-O, just_the_flu and 5 others like this. FWIW, when I've inquired about "hot runner coil" materials in the past, I was told they're made of Nichrome. Nickel, chromium, and iron. The same stuff the heating elements on your standard issue stovetop coil that heats your saucepan, the wires in a toaster, and space heater are made out of. The seller did not know if they were Nichrome 80, 110, or some other alloy. SilentJ, Baron23, 710Coils and 1 other person like this. 25mm axial seems legit, stoked to see you getting some. I wonder if it's going to be better to have a thick floor or a shallow floor banger with them. just_the_flu and 710Coils like this. Hmm well NV just announced that they will release a adapter to convert there pin out to XLR, there coils are priced at 35 plus shipping which comes out to ~$42. Depending how much the adapter costs your coil might still be cheaper. SilentJ, Baron23, Easywider and 1 other person like this. Baron23, Roth, scalescliffs and 2 others like this. Are you getting the 30mm Augusthaus coils as well?? Puddy, Baron23 and invertedisdead like this. Good. I didnt want to get the cheap china quartz. I will wait. While we are on the topic, where does 24mm stand? lol.. I was considering a E.ross / exbake coil. I am currently looking into also adding 30mm coils to the lineup and just need to get more funds together to place an order. There are some 24mm buckets out there. Mayoral 24mm, Quave Flat top XXL, Hoyes Quartz and e.ross for flat tops. Much more for banger style slant tops too. The only option is a 24mm from EZbake for $99 now if you want the axial, hybrid or bucket style coils, depending on what brand you get they call it something different. My only interest are those axial, hybrid or bucket style coils moving forward. 710Coils, just_the_flu and invertedisdead like this. I finally took care of posting my clip kits and they can be found on the below link. Ill order a kit or two when you have different colors silicone bands!!! Let me or us know when that happens.